The Our Lady of Blacktip Cathedral steeple, shown tilted toward Havana, has the small Caribbean island’s residents up in arms. Documents leaked on the internet this week, revealing the Our Lady of Blacktip Cathedral’s steeple is a disguised United States tactical missile aimed at Cuba, have shocked residents of the small Caribbean island. “To bring something like that to Blacktip, to keep it secret, it’s unconscionable,” said local activist Harry Pickett. “This is a 21st Century proxy war. Blacktip Island’s on the front line. 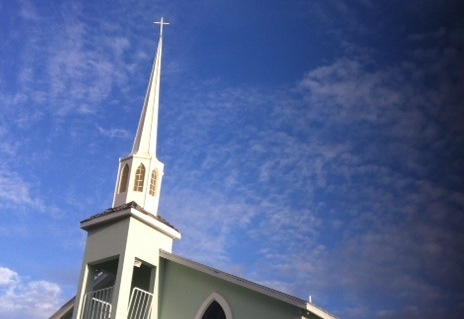 Conspiracy theories mushroomed last year when island residents noticed the steeple tilting and the cross rotating during a diplomatic spat between the Washington and Havana. The leaked documents give credence to those theories. The revelation has fueled concern other Blacktip Island landmarks might also be hiding weaponry. The news, combined with revelations last February of fish-shaped surveillance drones on popular island scuba sites, has island business interests worried. Meanwhile, the Caribbean island’s religious leaders are urging tolerance. “It’s not like anyone’s fired the missile. The Americans are just storing it,” said the former-Reverend Jerrod Ephesians. “And they’re paying us out the wazoo in storage fees. It’s a windfall for the church, and for the local economy.